1. Preheat the oven to 200°C, gas mark 6 and prepare the chimichurri. Whisk together the cider vinegar, lemon juice and olive oil in a bowl. 2. Finely chop all the fresh herbs and add to the vinegar and oil along with the dried chilli, salad onions and garlic. Leave to sit for at least 30 minutes for the flavours to develop. 3. When ready, remove half the chimichurri and place in a small bowl to serve with the steak. 4. Heat a griddle to hot, griddle the steaks for 3 minutes on each side, remove, smother with the remaining chimichurri and pop in the oven for a further 20 minutes for medium. 5. Take the beef out of the oven and leave to rest on a board. 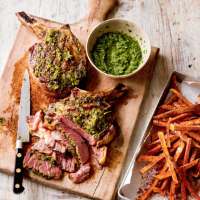 Serve the steak sliced with the chimichurri sauce and spiced sweet potato chips.